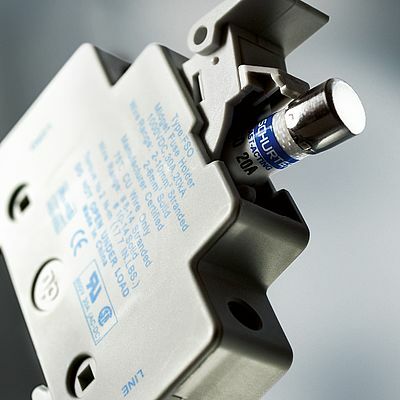 Specifically designed for the protection of photovoltaic systems, the ASO solar fuse from Schurter can safely protect PV modules and conductors from reverse overcurrent conditions. As PV systems have grown in size, so have the corresponding voltage requirements. This increase in system voltage has typically been intended to minimise power loss associated with long conductor runs. Standard circuit protection devices are not designed to completely protect photovoltaic panels. UL listed to safely interrupt faulted circuits at up to 1000 VDC, the device available in 13 different current ratings from 1 to 30 A to match specific requirements of various applications, such as inverters and battery charge controllers or to be used as inline or string fuse. A PCB version and bolted contacts are also available on request. Moreover, the company provides the appropriate touch-safe fuse holder and fuse clip. RoHs compliant device’s technical features include 20 kA breaking capacity at the rated voltage and 1.35 x ln minimum interrupting rating.